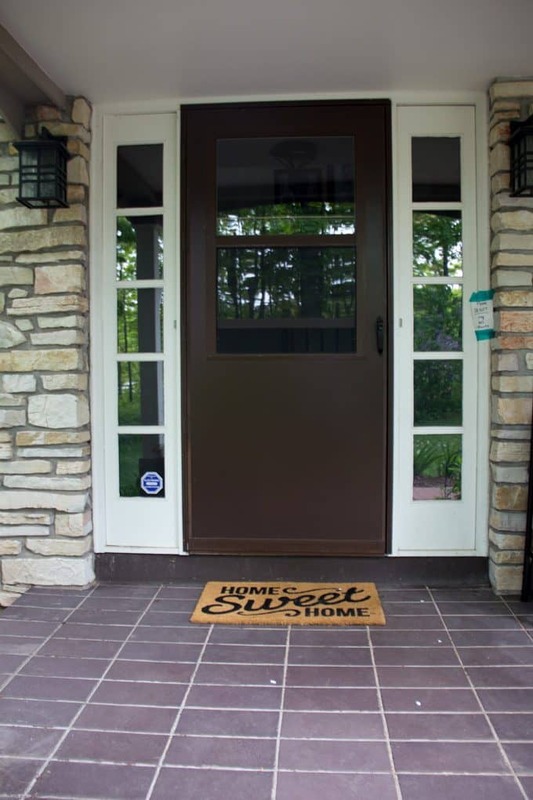 Today I’m sharing how Replacing our Front Door and Storm Door added value and was a fairly simple DIY project! Replacing our front door and storm door is one of the projects that I’ve wanted to do since moving in. Finally last weekend I tackled it and I am SO much happier with how it looks. 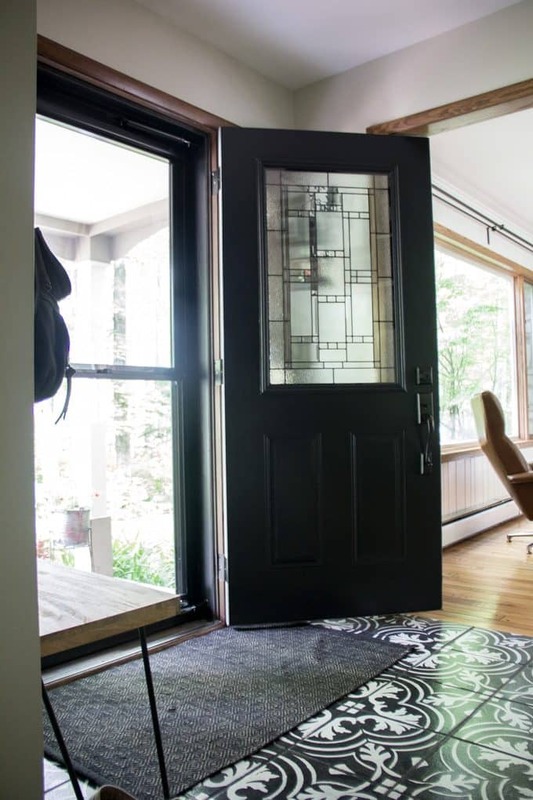 Because our front door is actually a door and sidelights with a storm door, replacing the door the right way should have involved purchasing an entire new door with sidelights and replacing the entire unit. We weren’t up for tackling that kind or project, but I realized that the hinges on our current door matched up with the new stock doors at Menards. 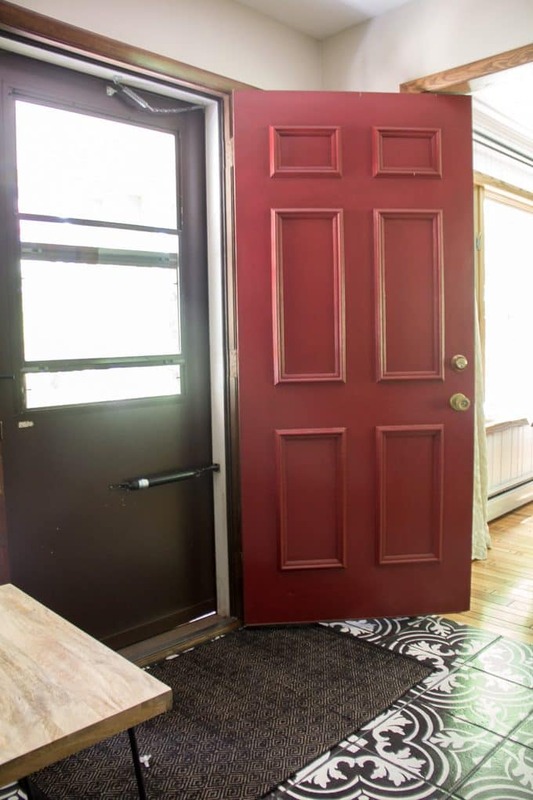 So we picked up this door for $250 and we were SO happy when the old hinges matched the new door perfectly. That kind of stuff NEVER happens right? I installed this handle and painted the outside of the door Black. Quite an improvement from the flat brown steel door with the gold knob right?! The door came primed and white, and I struggled with choosing a color to paint the inside. So of course I defaulted to my favorite accent color, Benjamin Moore Hidden Falls. 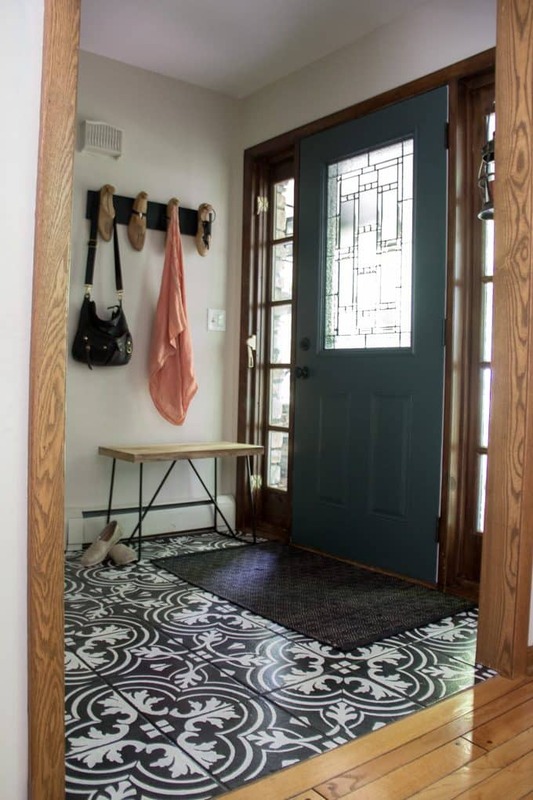 It’s barely a “Bright Green Door” as the blog is titled, but it is a green door! I’m happy to be somewhat true to the blog’s namesake again! Now for the storm door. 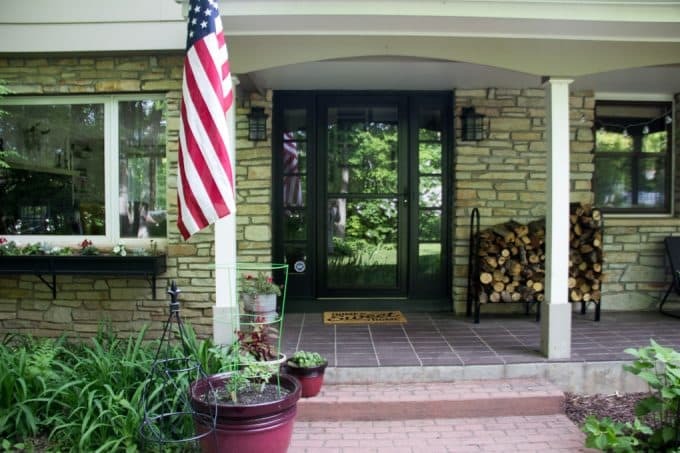 Remember how we started with this dated brown storm door? Then there’s the sign taped over the door bell threatening everyone to NOT ring the bell. 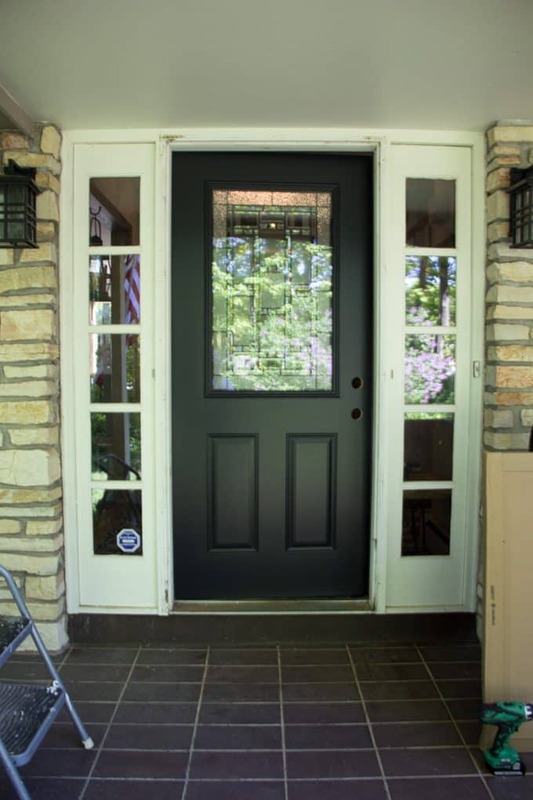 After installing the new front door I decided the black was so bold and gorgeous that the white sidelights just weren’t going to fly. So my Sunday afternoon turned into painting the sidelights black. I still need to do a final touchup, but I just couldn’t wait to share this. As much as I love how the door looks without a storm door we needed one. 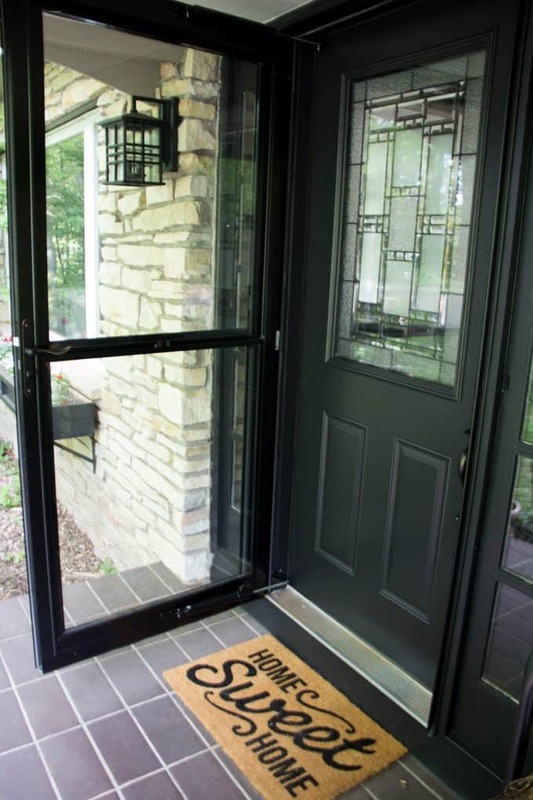 Most days the front door is wide open while we let the air in the storm door. I love this storm door so much that this is the third house that I have put this exact same storm door on. I’ve gotten faster at installing these, but it’s still a big project that took about 4 hours start to finish. It’s ridiculously hard to get a good picture due to all the reflections on the door, but I’m SO happy with how the whole project turned out. 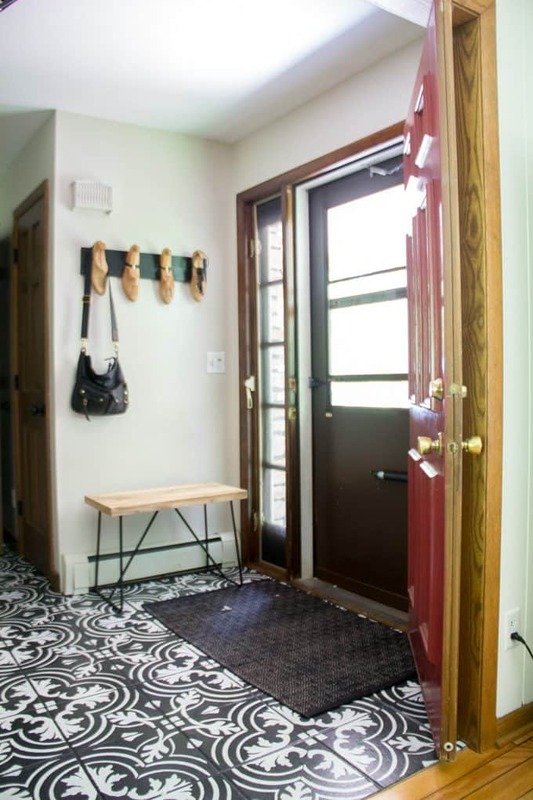 For about $750 we were able to update the door, the knob, the storm door and storm door knob. This is so much cheaper than if we would have replaced the entire door and sidelights. A few months back I replaced the lanterns. 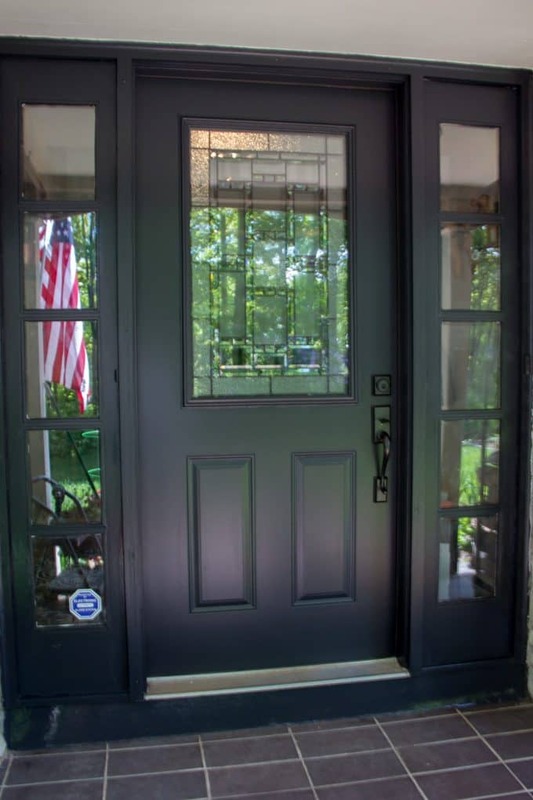 Then a few weeks back I painted the flower box black, now the front door and storm door match. Next up I’d love to paint all of our shutters black to match. Eventually my goal is to rid this house of all the brown that was everywhere. Even with the shutters still brown, I’m already so much happier with how the exterior looks. This entire front door update was done over the course of one weekend by mostly me alone… other than asking Matt to help hold a couple things here and there. 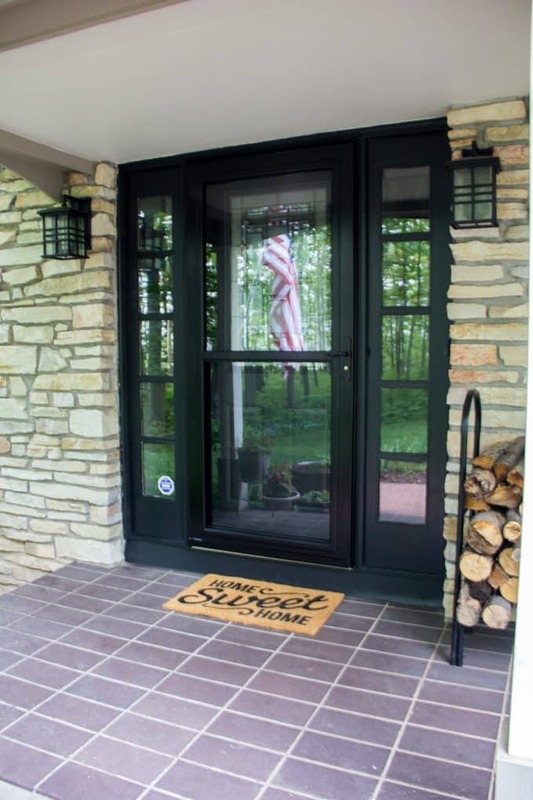 If you’ve got a flat steel door that you hate, or a ugly storm door, updating them are something anyone could DIY. 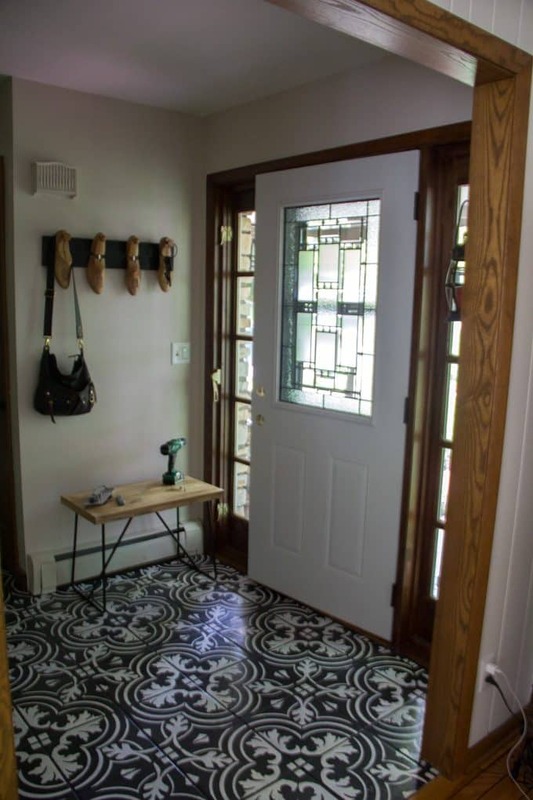 I hope this post inspires you to tackle your own door project! 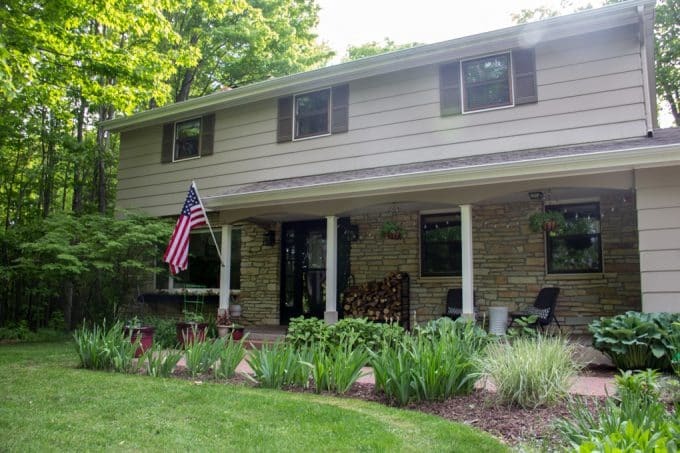 **Update** I got our shutters painted and shared all about it here! Here’s an updated photo of the exterior! Oh my gosh. 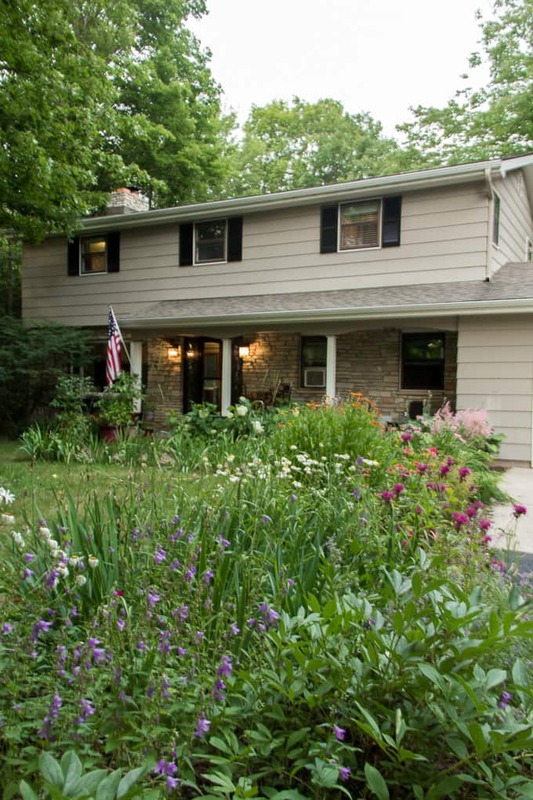 Painting the side windows really makes this an impressive entrance to your home. Beautiful job. I totally agree! It looks more elegant and high end! Thank you for stoping by!